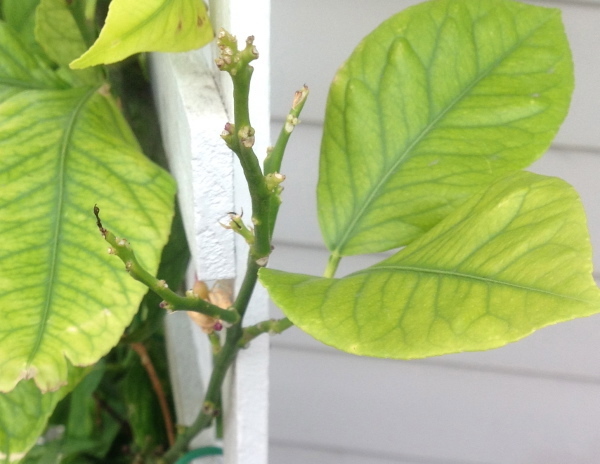 Autumn is a good time to check your citrus trees for magnesium deficiency. Citrus have a high magnesium requirement and magnesium is essential for the formation of chlorophyll (green colour) in leaves. Without enough magnesium plants will not be able to make sugars and starches, and growth will be poor. 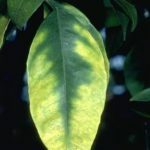 Magnesium deficiency often shows up in citrus in autumn because magnesium is also required for developing fruit and many citrus species produce fruit over the cooler months. Because magnesium is very mobile in plants, a shortage of this essential element results in magnesium being drawn from the older leaves to new growth. 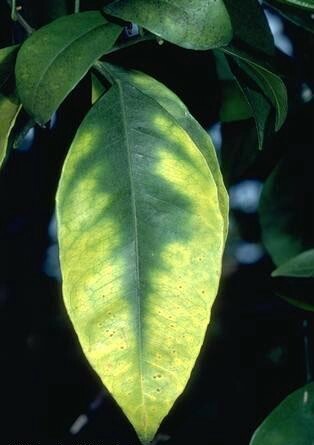 Deficiency shows as pale leaves, beginning with inter-vein yellowing of the outer edges of the oldest leaves, so that a green V remains with the point of the V at the leaf tip, and widest part of the V closest to the stem. In extreme cases, entire leaves may yellow. Magnesium deficiency can occur in several ways. If soil is too dry roots can’t absorb magnesium, so regular watering of citrus is necessary. It is more common where soil is quite acidic and this can be remedied by watering in some dolomite, which will supply magnesium, plus calcium to raise the pH. If soil pH is in a suitable range for citrus, magnesium deficiency can also occur where heavy rain has leached it from soil, or where excess potassium has been added to soil – this includes use of wood ash, or overuse of seaweed fertilisers, which can cause a build up of potassium. 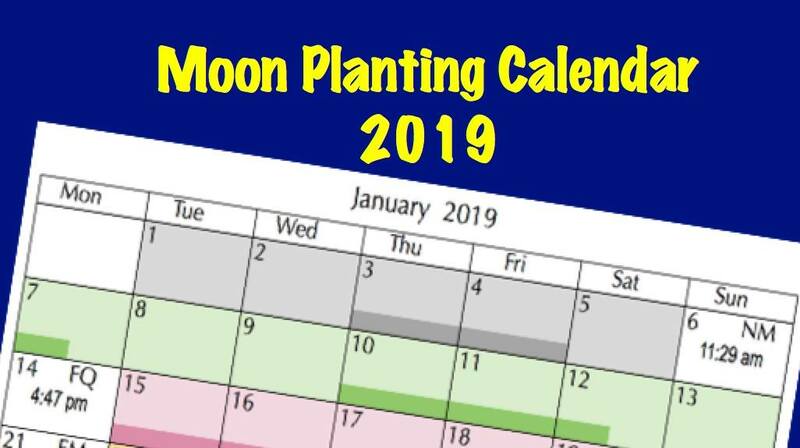 In these situations, a quick remedy to save this year’s crop is to dissolve some Epsom salts in a small amount of warm water, then dilute it in a full watering can of cold water, and water it into the soil under the outer part of the foliage canopy. You will need about 250 g of Epsom salts for a very young tree, and up to 2 kg for a fully-grown tree. Magnesium is also important for sweetness of fruit. If your citrus fruits are not as sweet as you would like, it could be due to magnesium deficiency. However, a general yellowing or paleness of all leaves (chlorosis), while only the veins remain green, could be the result of iron deficiency. Iron deficiency begins in the youngest leaves. This can occur where soil is too alkaline for the tree to absorb iron. If the alkalinity occurred through an accidental overdose of lime or dolomite, the pH can be lowered by adding elemental sulphur to the soil around the tree. If soils are generally alkaline, including some well-rotted cow or horse manure that has NOT had lime added (under mulch, but not dug in) as part of your fertiliser will help reduce the pH by replacing some of the calcium ions in soil with hydrogen ions as it decomposes. To prevent crop losses, it is worthwhile checking soil pH around citrus trees each spring, and correcting it, if necessary. This entry was posted in Fruits and Vegetables and tagged Aussie gardening, Australian gardening, backyard vegetables, citrus, climate change, easy gardening, easy organic gardening, environmentally friendly gardening, fertiliser, flowers, fruit, garden soil, gardening diary, growing plants, Healthy soil, Herbs, how to grow, iron, lemon trees, magnesium, Moon Planting diary, New Zealand gardening, organic gardening, plants, propagating, self-sufficient gardens, soil pH, sustainable gardening, vegetables, when to sow, yellow leaves. Bookmark the permalink. Fantastic! I have a lemon tree that has just started to yellow. I’ll give it a try. Fantastic blog. Keep it up! Hi -thanks for that great info that Ill put to use immediately. You would haen to also know about interveinal leaf yellowing and eventually necrosis in Fuyu Persimmons in Australia would you? The leaves on this years new branches were most effected and all eventually died along with the branches. Only the older branches retained leaves to last out the season, most having the interveinal discolouration. Thank for this helpful info. Hope it will save my orange and lime trees! So glad to have found you, thanks for the helpful info. Thank you for your input. I’ve been wondering how to eliminate this problem on my new ‘Lotsa Lemons’ potted tree. Thanks for the info. I will give the tree some Epsom salts. The tree is covered in small fruit and flowers which I do not want to stop developing. 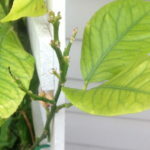 My young lemon tree is yellowing and I have applied Epsom Salt around its drip line today. My question is, how often do I give the tree the salts? Hi, I have a young lemon tree in a large timber tub.It has a lot of fruit,but leaves are turning yellow and falling off! Please help! don’t wan’t to loose the fruit!! Hi Beatriz, it is impossible to pinpoint the cause of your problem without a photo or further description of the yellowing because the pattern of of yellowing on leaves, or whether it began on youngest or older leaves first give clues to the origin of the problem. Also, you haven’t said where you live so I don’t know what sort of climate conditions you are dealing with. Thank you very much!! I’ve looked for information everywhere and you guys really helped me out! Thank you so much. A great article. hi my citrus seedling is white please can you tell me why? Sally, your poor seedling has extreme iron deficiency. The pH of the surrounding soil (or potting mix) is too high for the plant to absorb iron, which is one of the elements essential to providing the green colouring in leaves. If it is in a pot, you can re-pot it into some potting mix that has a pH of around 6.5–7.0. If it is in the ground, you can follow the instructions in the last paragraph of the post above, or purchase some chelated iron and apply it according to directions. However, unless you correct the soil pH, you will continue to have problems as the pH of soil controls the availability of nutrients. See Soil pH is so important. Thanks for the article. It appears that ph value is very important. In our farm, newly formed leaves are pale in color (almost white). What could be the reason? Which fertilizer would be most suitable? The plants are about 4 years old. Thanks in advance. Lyn, Thank you for taking your time to write this article I have found it very thought provoking. If you don’t mind I would like to ask a few questions as my family have tried many times and failed on our property to get citrus to grow. I live in Gladstone Central Qld. My leaves look more like the first picture but splotchy yellow not so much of a V then the second picture, new growth which there is a huge burst of is perfect green and waxy looking. 1. I have placed blended poultry mulch around each tree with slow release fertilizer and am following the instructions of a liquid fish fertilizer weekly. My beds are sandy/loamy soil. I have 2-3″ of sugar cane mulch covering the entire citrus orchard area so there is no grass or weeds. 2. I have been probing the ground with a moisture probe and it tells me I over watering so I have stopped/slowed watering to keep gauge in the “moist” zone. Is this right? 3. I am using a probe pH test atm and it is reading 4-5pH. To correct this I have added spray on eco-flo Lime and placed Dolomite power around. How long do you wait to see if you need another dose? Is there a better approach? 4. On 2 trees I ran out of poultry blend mulch and used cow blend mulch, will this have a negative effect on those 2 trees? These are 2 new trees, one of the trees I noticed today is getting some yellowing around the crown but has a lot of flowers/new growth beginning. The other one is still showing leaf curl in the crown of the tree but no yellowing. I have had both trees planted out for 2-3 weeks now and were healthy as you can get from Bunnings going in. Paul, apart from over-watering, your problem appears to be your very acidic soil, if your reading is reliable. None of the major nutrients is available to plants in that range and you are wasting the fertiliser you have applied. I say ‘if the reading is reliable’ because I don’t think probes are the best way to get a pH reading unless you take multiple readings in a plant area, add them up, then divide by the number of readings to get the average pH for that area. A simpler way to do it is to use a Manutec pH Test Kit. Agricultural lime or dolomite take about a month to have an effect on soil pH. Test again after that time and apply another dose if necessary. Hi There, I have a new Mandarin tree approx 6′ high. I planted it a month ago & added 4-5 handfuls of Gypsum at the base of the hole as there was clay below it & I thought the Gypsum would start to break up the clay for root penetration etc. However I have found that the leaves are turning yellow and wonder if I should pull out the mandarin and remove the Gypsum OR whether I can apply Elemental Sulphur or any other product to lower the Ph although I would think I’d have to get this done quickly..? Please advise, and thanks. You say that seaweed fertilisers are high in potassium. Maybe you should be more specific. Seaweed extracts are often referred to as fertilisers but this is a mistake. Many seaweed products (eg Seasol) contain negligible amounts of NPK. They have natural plant hormones that stimulate growth. Of course some seaweed products do contain NPK (added) so of course you must always check the label. Most available seaweed products are proportionally higher in potassium (K) than nitrogen (N) and phosphorus (P). For example, Seasol contains 0.1% N, 0.01% P, and 1.5% potassium, which is 15 times more than nitrogen. Acadia contains 1.0-2.0% N, 1.0-2.0% P, and 16-20% K. In contrast, Natrakelp’s 18-3-10 has considerable amounts of NPK added, with nitrogen being the dominant nutrient. Problems can occur when people use only seaweed extract as a fertiliser, and some apply it every fortnight, resulting in an imbalance of nutrients available to plants. Seaweed extracts are only a supplementary fertiliser and it is the natural growth promoters and amino acids that provide many of its benefits to plants, including an improved immune system, pest resistance, and better tolerance of heat and cold. Thanks so much for this article. The last part about possible iron deficiency seems to be so relevant to my lemon tree (sapling really) , which in my observation has been languishing, its recent tiny shoots not developing and its leaves especially newer shoots having just the appearance you describe as possibly signifying iron deficiency. And now, prompted by your article, I’ve tested the soil in various places next to it with a Searles testing kit, which in my experience has rendered useful results in the past. I found that the highest Ph levels – ie the more purplish resuls – seem to occur within a small circle corresponding to the circle of cow manure I applied around the sapling a few weeks ago. It looks like about Ph9 according to the testing colour chart supplied. Then I tested the manure itself with the kit. It’s supposed to be a premium product with no additives but it turned bright purple indicating I assume a Ph of perhaps 13 or 14, unless the results for manure have a different meaning than those for soil?? Perhaps this is normal but surely not? Anyway I’ve now contacted the supplier of the manure and am waiting for a call back. I think there may have been a mild problem before, leading to slowish growth but since the addition of the manure all growth has ceased. But at least if I know the problem I can address it if possible. I am not familiar with Searle’s pH test kit, Cynthia, and their website does not provide any details of the kit. The Manutec one that I use shows strong purple at 9.5-10. It is quite possible that the high pH reading for cow manures is due to the addition of lime. Apparently, some customers complained about the smell of cow manure and processors began adding lime to reduce the odour. Unfortunately, this can raise the pH to an unsuitable level where plants can’t absorb the nutrients they need for growth. It is wise to always test the pH of manures, soil improvers, and composts before use so that you can sulphur or iron chelates, or mix through compost with a lower pH to reduce the problem.